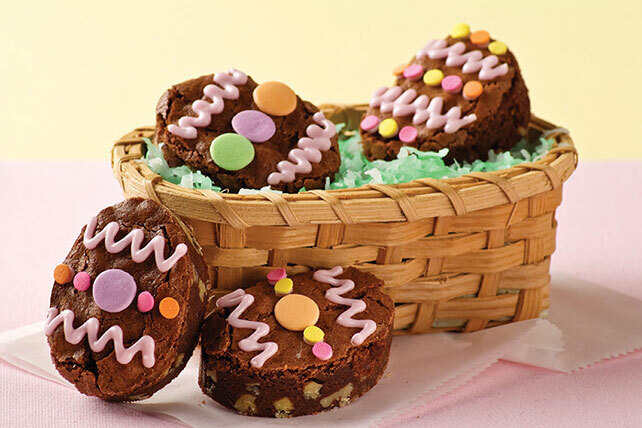 Give your brownies some holiday style with this BAKER'S ONE BOWL Easter Egg Brownies recipe. These Easter egg brownies are both colorful and delicious. Line 13x9-inch pan with foil, with ends extending over sides. Grease foil; set aside. Microwave chocolate and butter in large microwaveable bowl on HIGH 2 min. or until butter is melted. Stir until chocolate is completely melted. Add sugar; mix well. Blend in eggs and vanilla. Stir in flour and nuts until well blended; spread into prepared pan. Place chocolate and butter in medium saucepan; cook on very low heat until chocolate and butter are melted, stirring constantly. Remove from heat. Continue as directed. Substitute 13x9-inch glass baking dish for the baking pan. Prepare brownies and bake as directed, reducing oven temperature to 325°F.